Posted on Sat, Oct 1, 2011 : 3:12 p.m. The solar panels on the roof of the Ypsilanti Food Cooperative, the first business in Ypsilanti to have solar panels installed. Next time you turn on your television, don't be surprised to see a promotion for SolarYpsi, a group of Ypsilanti residents bringing solar power to their community. Dave Strenski is the spokesperson on the video and a member of SolarYpsi. "I'm more of a geek than an environmentalist," said Strenski. "This whole thing started with a small grant at the co-op." 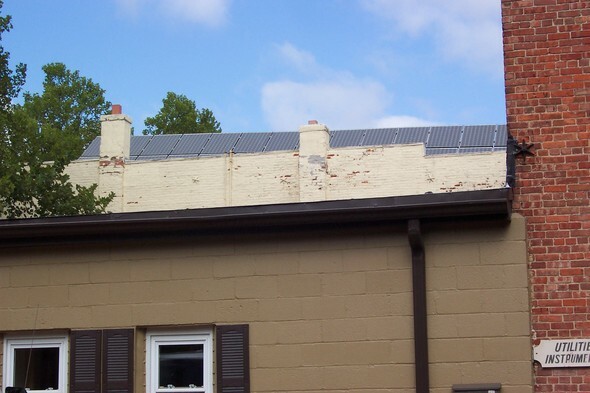 Strenski is referring to the Ypsilanti Food Cooperative, which in 2005 became the first building in Ypsilanti to have solar panels installed. The co-op was among six locations showcased today for the National Solar Tour. The others are the River Street Bakery adjacent to the co-op, Adams S.T.E.M. Academy, Corner Brewery, a rental unit at 403 South Huron, and Ypsilanti City Hall, where Strenski greeted visitors. "All the sites in Ypsilanti are a little different," said Strenski, who says that his goal is to make Ypsilanti the world's solar power destination. Strenski worked with Google, which provided free software to monitor power coming through the solar panels at some of the locations. The video is now being broadcast nationwide and can be seen below. At the Ypsilanti Food Coop today, marketing coordinator and beekeeper Lisa Bashert told visitors that 40 percent of the co-op is run by solar power and 100 percent of the bakery is. "Co-ops have been green since the beginning, and we believe in educating and serving our customers in the most ethical and environmentally-conscious way," Bashert said. Another one of the more recent Ypsilanti buildings to install a solar energy system is the Adams Academy, a school with grades K-6 that emphasizes science, technology, engineering and math. The school applied for a solar grant from the Michigan Renewable School Program in 2010 and the solar system was installed and operational this past spring. A house on South Huron with three apartment units installed 55 solar panels this summer, and this fall, the Corner Brewery won approval from the Ypsilanti Historic Commission to install 144 panels on its brewery on Norris Street, a project that tentatively will be completed by the end of the year. Strenski says that although Michigan isn't known for getting a lot of sun, even on an overcast day like today there is power being made. "We have more sun than Germany, and Germany is the world's leader in solar production," he said. The National Solar Tour is an annual event, and today participants will visit 5,500 buildings in more than 3,000 communities across the U.S.
Lisa Carolin is a freelance reporter for AnnArbor.com. Reach the news desk at news@annarbor.com. Sun, Oct 2, 2011 : 2:23 p.m.
Ignatz, &quot; In 1982 (the earliest data provided), the United States operate 301 refineries with a combined capacity of 17.9 million barrels (2,850,000 m3) of crude oil each calendar day. In 2010, there were 149 operable U.S. refineries with a combined capacity of 17.6 million barrels (2,800,000 m3) per calendar day.&quot; from <a href="http://en.wikipedia.org/wiki/Oil_refinery" rel='nofollow'>http://en.wikipedia.org/wiki/Oil_refinery</a> I would tend to agree oil company exec's make to much money. Although I would argue anyone who has to deal with EPA on a daily basis may deserve a large salary. Sun, Oct 2, 2011 : 12:37 p.m. There is a web site that breaks down the cost of various types of power. <a href="http://greenecon.net/understanding-the-cost-of-solar-energy/energy_economics.html" rel='nofollow'>http://greenecon.net/understanding-the-cost-of-solar-energy/energy_economics.html</a> Solar appears to be 8X the cost of oil or natural gas. The wind and solar industry would go broke if governments did not support it with tax $'s. Since spending of tax dollars requires choices, would we be better off spending the money on better roads? Mon, Oct 3, 2011 : 12:51 p.m. Since sunlight is an infinitely renewable, sustainable resource and oil/gas are not, it makes sense to invest in solar. &quot;Industry&quot; doesn't matter one way or another, if we are at or past peak production of fossil fuels (and discoveries has been dropping since 1965). Just because fossil fuels are relatively cheap now, doesn't mean they will be in a future where there is less &amp; less, and more &amp; more countries are competing for them. Also, don't forget, the oil industry is ALSO heavily subsidized, more so than solar. In view of these facts, we should stop subsidies to oil &amp; gas and instead invest in renewables and public transportation, IMHO. Sun, Oct 2, 2011 : 12:45 p.m. Given that solar installation companies are not run by overpaid execs who don't do much to extract the oil and gas, I'd rather see solar get subsidies. Oil companies are raking in obscene profits while receiving taxpayers money. They refuse to improve and expand refining processes that would reduce the price of their finished product that no matter what you do to it, adds to planetary air pollution, unlike solar. Sun, Oct 2, 2011 : 12:16 p.m.
OK, what is NOT stated, other than the mention that this &quot;started with a small grant at the co-op,&quot; is how much of YOUR tax dollars go to subsidize solar power. Lisa, that would be an inetersting angle to this article. There is not one solar project that is viable on its own without a grant or &quot;free&quot; money from the government, which by the way is not really free. Sun, Oct 2, 2011 : 3:25 a.m.
What a great commercial! Congrats to the progressive thinking of all involved! Sun, Oct 2, 2011 : 1:02 a.m. Sat, Oct 1, 2011 : 11:24 p.m. Since when is solar panels part of historical homes?